Get ready to laugh with us in the New Theatre’s Piano Bar as we bring you a night filled with hilarity at our monthly comedy club. Each show will feature the best local talent from right here in Oxford, as well as top up-and-coming talent from around the country. Leave your troubles at the door and enjoy a night of entertainment from some of the funniest people around. This month features five of the best comics on the circuit . Tickets are £15 in advance/£17.50 at the door. You know who probably gives good and practical advice? Comedians. There's only one way to test that theory. Join QED Comedy Lab on Saturday 23 February, as our performers are called up to the stage to answer real queries from advice columns we found while scouring the internet as well as taking questions from the audience. What sort of help can they provide the lovelorn? Can they provide practical advice on automobile maintenance? What do they know about etiquette? Join us as our comics give you their two cents on any and all topics. This month features the amazing headliner:Lorna Shaw (BBC Comedy, Radio 4) and a great opener: Mark Cram as well as well as a line-up of three other great comics TBA. This month features the amazing headliner: Cally Beaton (Raio 4, QI) as well as the phenomenal Esther Manito (BBC new comedy award nominee, So You Think You’re Funny Finalist) opening. We also have Local comedian Chelsea Burkby (So You Think You’re Funny Finalist) and it’s all hosted by our own Anna Dominey. This month we have a special guest headliner Sean Sellers! Known as one of the best dressed men in British comedy, Sean's all about attitude and charisma. Part attention-seeker, part people-pleaser, his stand up is a high-energy blend of pop culture references, personal anecdotes, and playful punchlines. At It's Debatable! pairs of comedians are given topics at the beginning of the show, they then have two minutes each to present their arguments, one minute each for rebuttal and then the audience gets to decide who wins! Don't miss the show that the Oxford Times called: "Chaotically charismatic....friendly and inclusive....witty and fun....a fish shaped serving plate." Featuring: Matt Chadourne and more to be announced! At the Trinity College Beer Cellar in Trinity College, Oxford. Open to the public. On a quest for the funniest evening in Oxford? Here it is! 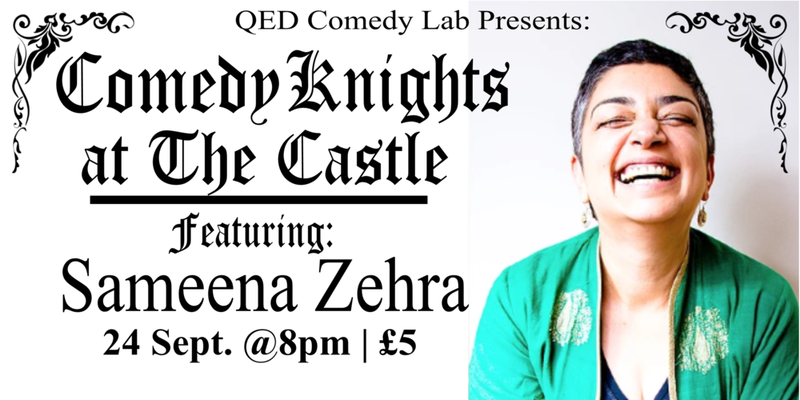 Join us at the newly renovated Castle Tavern for Comedy Knights, a monthly stand-up showcase that features some of the finest local and national comedians around - but instead of the high comedy club price tag, it’s just £5. 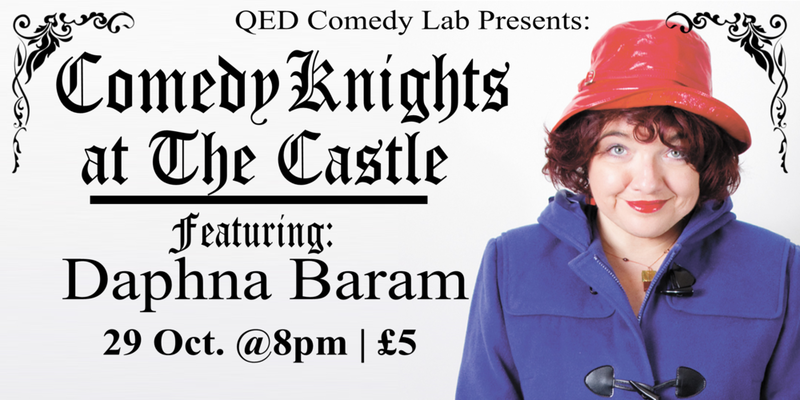 This month we have a special guest headliner Daphna Baram! Daphna is a London based, Israeli-born stand up comedian. With background in human rights law and Journalism (Ha’aretz, The Guardian, BBC, AlJazeera, New Statesman, The Independent), she has been performing stand up comedy since 2010 in various clubs in the UK and Europe. Among others: The Stand Edinburgh, Glasgow and Newcastle, Yes Bar Glasgow, Beehive Edinburgh, Breakneck Aberdeen, Hampstead Comedy Club London, Gags on the Green Peterborough; Stand Up on the Strand in Kent, Wine Gums in Cambridge; The International, Dublin. Personally political comedy. ‘An extremely sharp, caustic sense of humour and a very wicked streak.’ Despite all appearances to the contrary, Baram is "that" friend, who whispers bad ideas into your ear and has you constantly exclaiming "I can't believe you said that!" Feel free to message us with any questions. See you Monday! Don't miss the show that the Oxford Times called: "Chaotically charismatic....friendly and inclusive....witty and fun....a fish shaped serving plate." On a quest for the funniest evening in Oxford? Here it is! 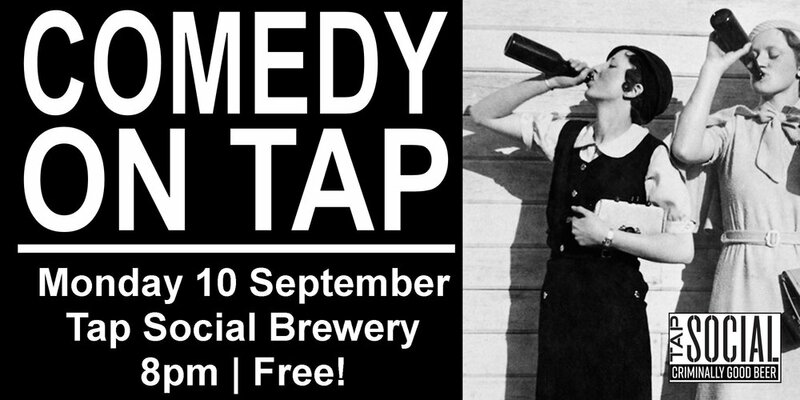 Join us at the newly renovated Castle Tavern for Comedy Knights, a monthly stand-up showcase that features some of the finest local and national comedians around - but instead of the high comedy club price tag, it’s absolutely free. This month we have a special guest headliner: Hannah Silvester! Also featuring Claire Nelson, Steve Lee, and Dan Squire! Back by inexplicable demand! It's a night of competitive pun making as we elevate the lowest form of humor to an art form (or not) as our panel of comedians create puns on the spot. 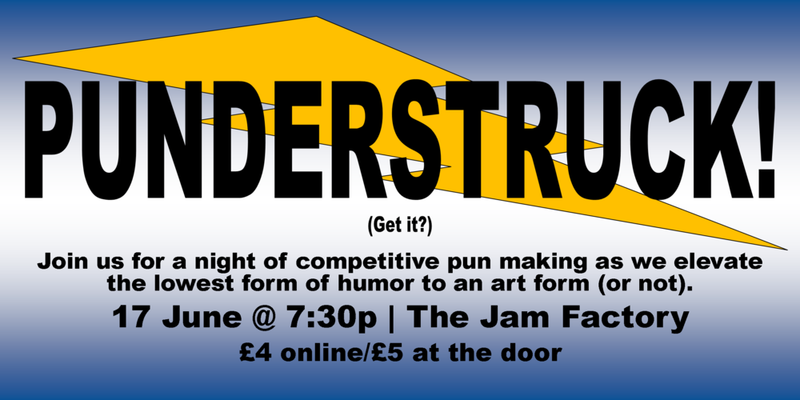 It promises to be an evening of laughter and/or groan inducing comedy. 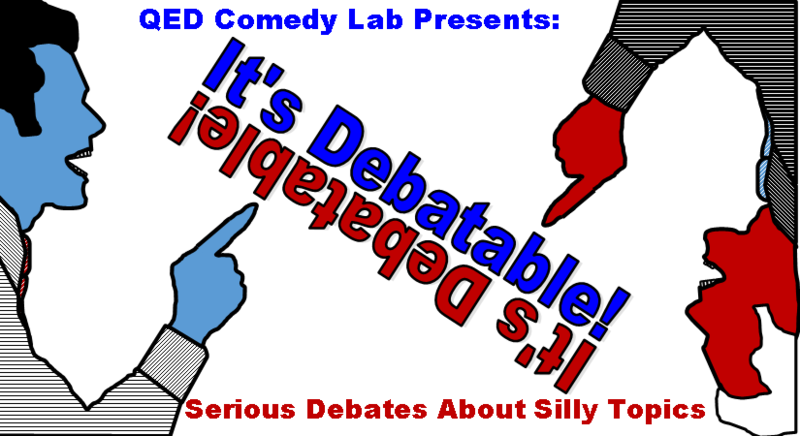 From the minds that brought you It's Debatable! 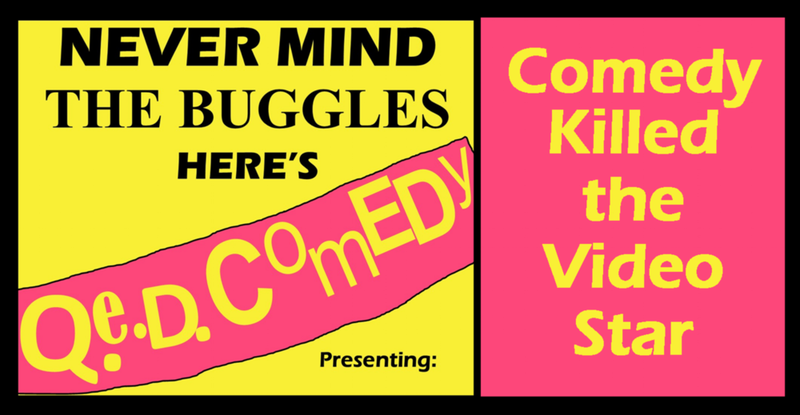 a comedy debate show, Comedy Killed the Video Star and the Oxford Festival Fringe Preview Comedy Festival.